Joyce and Tobias moved to their new home just in time! Beverly summons a friend to help out with this odd situation. 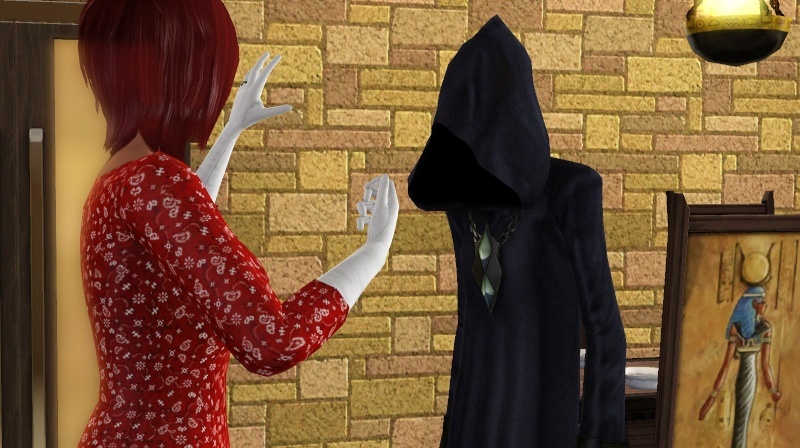 How can my Sim summon Grim? I've wished for that option more than once. Actually that was just part of the story. 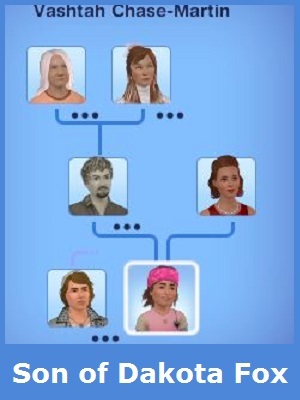 (Sorry) What I actually did was Trigger Age Transition of the elder that the wishing well generated. Just happened Grim hung around a bit so I took advantage for some photos. Would have been soo nice to be able to call on Grim. Good story telling. Love to read. Do you by any chance have Grim's Manor from the store? You can use the door from that set to call on Grim. Not sure if the PC door comes alone or not. But I have added the door to other cemeteries and to a couple residential lots. 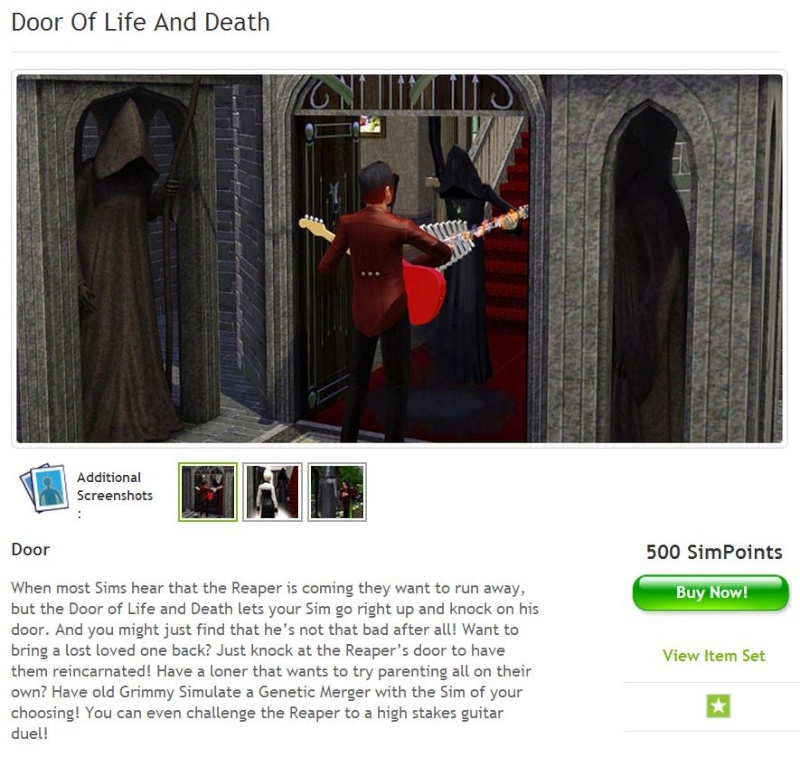 You can call on Grim for a chat or to challenge to a guitar duel. The door will attract any Zombie and convert them back to normal. Pesky paparazzi are also attracted and eliminated. 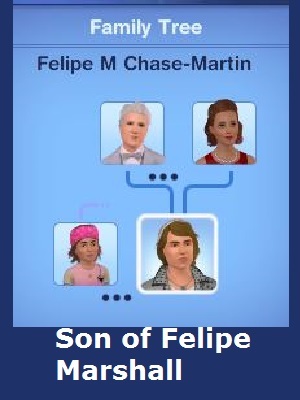 Other options include renaming your Sim, creating a genetic merger with other Sims and resurecting Sims. Resurection can be a surprise and your beloved family member has a chance of coming back as a family pet! The full set including the lot can serve as the local cemetery. It was promoted as 'Easy to place' but a 25 wide by 50 deep lot requires a special lot of same or like size. Ooooooooooooo.....I didn't realize all those options were available. I do have Grims Manor and placed it in Midnight Hollow, somewhere in the middle of the landscape. 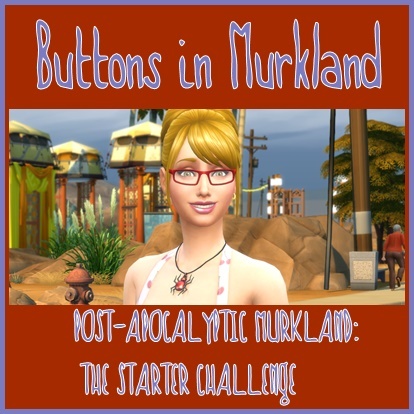 I'll be looking forward to placing it in Starlight Shores, which will be my next world to play. Beverly has been busy managing the Gypsy Wagon now that she is at the top of her career. 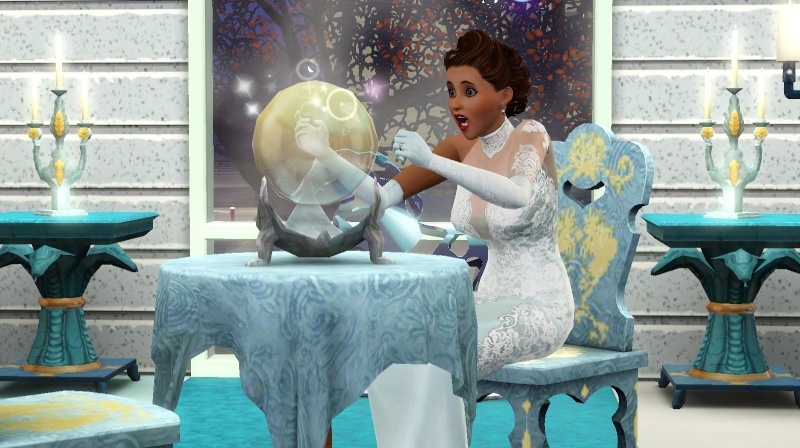 Wonder what she sees in the Crystal Ball? Going to add more pics later as they seem very slow to load right now. Me too. Love, love, love this room! I am really happy with the way the room and the picture turned out. The colours looks amazing together. Love it too. I'd love to see more. It is part of my foundation/frieze experiment. 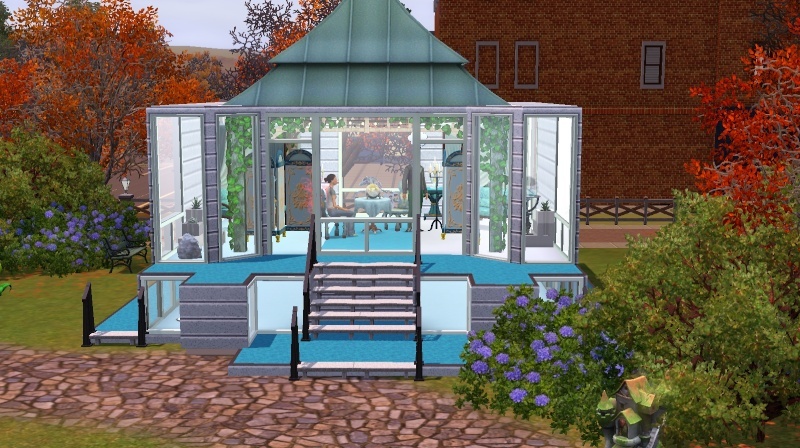 It was built in the dog park in Appaloosa Plains but I am considering recreating it on a smaller lot. This is the overall picture of the building. I will add more pictures after work. Oooooooooo...... is it after work yet???? I will add more pictures after work. Playing with the main construction was the most challenging part. I am still pondering recreating it but need to decide. Stand alone lot? or part of another build? 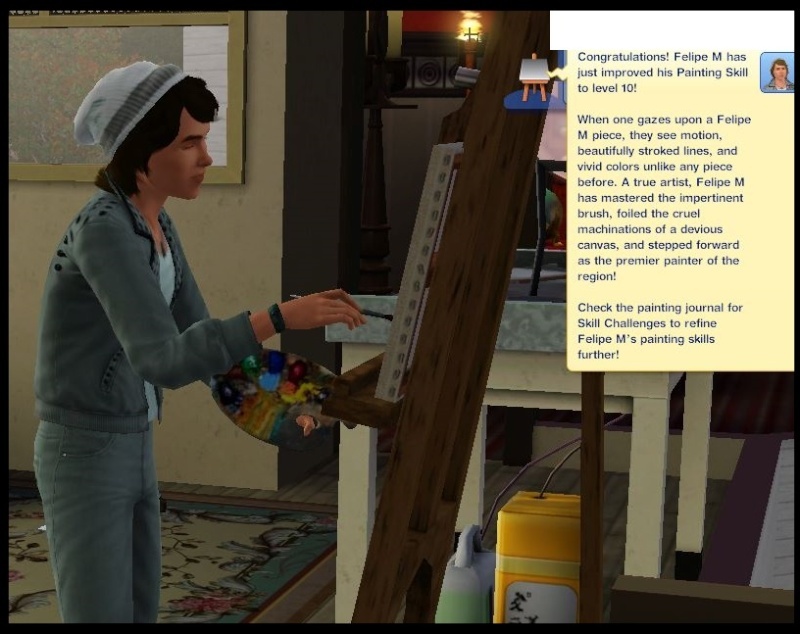 Thank you .... he is still a teen and is in the Painter career. He also met his LTW of Illustrious Author /Level 10 in Painting and Writing without having written a single page.